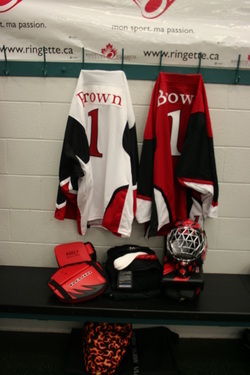 I started playing Ringette at the age of 6 in Kitchener, Ontario. Halfway through my first season, I already knew my love was as a goalie. I played with the Kitchener Ringette Association until I went away to University of Toronto for school. While in University, I enjoyed stints with the Waterloo and Sudbury Ringette Associations, and eventually headed out west to backstop the Edmonton WAM! in the National Ringette League for 10 years. I started playing roller hockey (or inline hockey) my first year of University, which quickly lead to several trips and tournaments around North America. The World Championships for Women started in Rochester, New York in 2002 where I helped Team Canada capture our first of 4 Gold Medals with a 2-0 win in the Championship game. We have travelled to the following countries to attend World Championships each summer: USA, France, Colombia, Czech Republic, Germany, and Italy. I was the first female to play high school boys hockey in Central Western Ontario, and chose University of Toronto's varsity hockey program to continue my playing days. A few years playing for the Scarborough Sting and the Mississauga Ice Bears in the National Women's Hockey League, then I moved out to Edmonton to play on the Edmonton Chimos in the Western Women's Hockey League. I finished a 4 year undergraduate degree at the University of Toronto (majored in Psychology and Criminology, minored in Women's Studies), then headed to Osgoode Hall Law School and got called to the Ontario Bar in 2003. I was called to the Alberta Bar in 2004 after moving out to Edmonton, and I am currently the General Counsel for the Edmonton Oilers (NHL), Edmonton Oil Kings (Western Hockey League) and Aquila Productions (Oil Change Series).